Health and medicine in colonial environments is one of the newest areas in the history of medicine, but one in which the Caribbean is conspicuously absent. Yet the complex and fascinating history of the Caribbean, borne of the ways European colonialism combined with slavery, indentureship, migrant labour and plantation agriculture, led to the emergence of new social and cultural forms which are especially evident the area of health and medicine. The history of medical care in the Caribbean is also a history of the transfer of cultural practices from Africa and Asia, the process of creolization in the African and Asian diasporas, the perseverance of indigenous and popular medicine, and the emergence of distinct forms of western medical professionalism, science, and practice. This collection, which covers the French, Hispanic, Dutch, and British Caribbean, explores the cultural and social domains of medical experience and considers the dynamics and tensions of power. The chapters emphasize contestations over forms of medicalization and the controls of public health and address the politics of professionalization, not simply as an expression of colonial power but also of the power of a local elite against colonial or neo-colonial control. They pay particular attention to the significance of race and gender, focusing on such topics as conflicts over medical professionalization, control of women’s bodies and childbirth, and competition between ‘European’ and ‘Indigenous’ healers and healing practices. 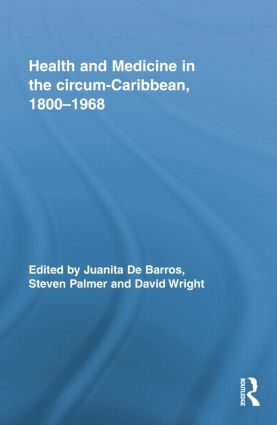 Employing a broad range of subjects and methodological approaches, this collection constitutes the first edited volume on the history of health and medicine in the circum-Caribbean region and is therefore required reading for anyone interested in the history of colonial and post-colonial medicine.